This activity worksheet has been designed to be used in conjunction with the open source Carbon Cycle Interactive module (located at the URL indicated above) developed by the Annenberg Foundation. Before civilization began to impact the human life cycle approximately 10,000 years ago, human beings had high birth and death rates. Today the world is in the midst of a demographic transition — a transition to low birth and death rates — as the ability to control both disease and reproduction increases. Along the way, between these extremes, populations go through an intermediate period of continued high birth rates, combined with low death rates, resulting in a population explosion. Because countries span a continuum along this transition, looking at the present demographics of countries around the world provides an opportunity to look forward or backwards in time: a post-transition country can get a glimpse of a situation resembling its own past from countries still in transition, and a transitional country may get a hint of its demographic future from countries that are further along the continuum. Please note that our model does not take immigration into account, so we are looking at birth and death rates only. Birth and death rates are expressed in a number of different ways. Overall rates are often expressed as the number of births per woman over her whole life, and deaths per year. But for use in predicting population growth, population models use birth and death rates specific to each age group, over a step of 5 years. In this simulator, the overall rates are shown on buttons in the grey box. When you click the buttons, a detail dialog shows the age group specific rates. Click on the OPEN SIMULATOR icon. The following screen should appear. 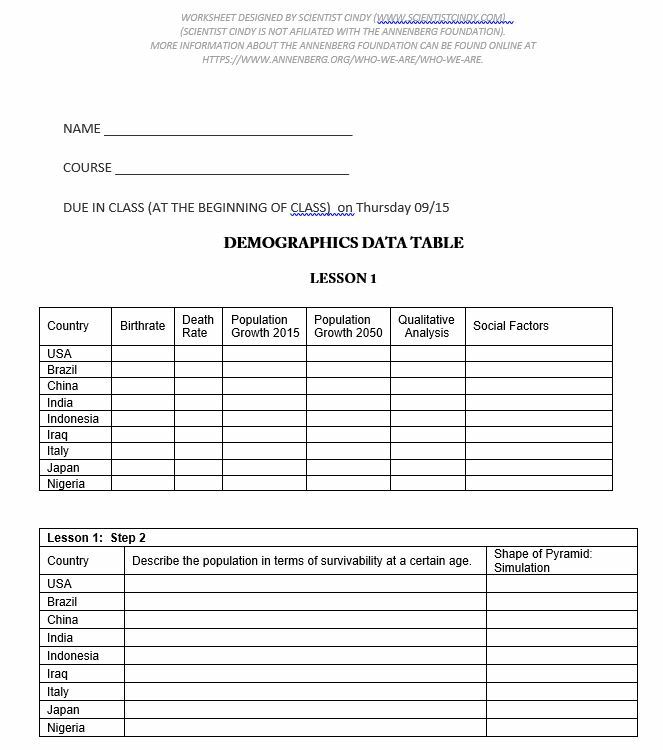 Make sure the LESSON portion is set on “Demographic transition” and the COUNTRY portion is set to USA, (You will notice a dropdown menu to select other LESSONS and other COUNTRIES). Now click on Run button. Notice that both the line graph and the pyramid graphs have changed shape. For each of the 7 available countries, run the simulation and record their population growth rates at the end of the simulated period in the Data Table and number the countries by growth rate from highest (earliest in the demographic transition) to lowest (farthest along the transition). Write down all of your data and input your description in the data table located In this packet. When you are done with the Demographic Data Table, proceed to the next step. Watch the 5 minute video. Click on the PLAY icon located at the bottom left corner of the screen. Take a mental note of HOW AND WHERE the population increases over time. Use your cursor to hover over the milestones indicated at the bottom of the simulation. How does the shape of the population pyramid differ from most developed to least developed country? People in the “prime of life” (aged roughly 20-60, depending on local conditions), support the populations younger and older than themselves. How might this impact the quality of life in countries with the various shapes of demographic pyramids? Where do we see the populations grow on the WORLD POPULATON MAP? Explain the events that lead to a significant decrease in the world’s population between 1300 and 1400 AD/CE. Name the 6 plagues that are listed in the simulation (medicine bag icon). The observation that lead to GERM THEORY was made about what year? When were flush toilets introduced and how did that help to increase the world’s population? 5) About what century did we begin to see a significant population increase in the US? 6) When was the Industrial Revolution? 7) What impact did the Industrial Revolution have on population? 8) Use your cursor to select any (OPEN CIRCLE) dot of your choice in the map at any point in time you chose. Write down the information of interest about that place at that time. 9) Pick any point in time that interests you and write down the significant MILESTONES of that time. 10) What do you think was the single most important factor in determining human population throughout history and WHY? Compare the pyramid shape of the countries that you found to be late in the transition to those that are earlier in the transition. Predict what you expect the shape of each pyramid to be in 2050. Then simulate it, and note the actual resulting pyramid shape. For example, the United States has a house-shaped “pyramid”. Nigeria has a young-heavy wide base. Indonesia looks like an onion dome in 2015. Decreasing populations progress into an “inverted pyramid”, where the top is wider than the base.